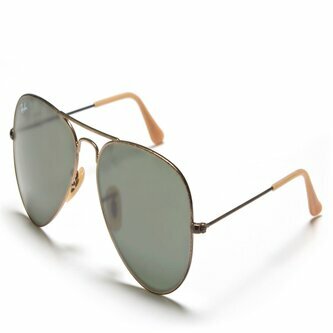 Made in Italy, these Aviator Green Sunglasses form Ray-Ban's are one of the brand's most popular and prestigious collections. Originally developed to combat the blinding glare experienced by US Air Force pilots, Ray-Ban Aviators merged formidable design with cutting-edge technology and changed the face of society forever. Larger in lens size than other Aviator models, the frame remains strong and is perfectly suited to the demands of daily life. With a green tint to the polarized lenses, this results in a drastic reduction in the brightness of shiny surfaces meaning less distractions in both your active and social lifestyle. With the frame arms resting gently on your ears, the iconic Ray-Ban logo is applied to the right lens as a distinct finishing touch to show off the name. More than simply sunglasses, Ray-Ban are a way of life that have enveloped their own distinct culture and stylish following while creating a look high on prestige and fashion.